We are sort of settling into a routine with our new addition. I’m not gonna lie, life with a puppy is a challenge but so much fun. Our first week with Cooper was a complete whirlwind of a week and has got me thinking about food that you can have stocked up in your freezer for days when you just can’t get out of the house! You know, snow days, new baby days, new puppy days! We’ve had one or two of those in the first two weeks with our little Coops. One of the most popular meals for times like this a good lasagne. Vegetarian lasagne was one of the first meals I mastered as a new vegetarian way back when. It’s also one of those meals you bring around to friends and family in times of crisis. See new puppy! It’s a kind of lifesaver meal. A good vegetarian lasagne is a thing of real beauty and everyone has their own favourite way of making it and their own favourite fillings. This is our favourite. Vegetarian lasagne is so popular in my house that it wins out over a meaty one so much so that I rarely make the traditional lasagne anymore, which is a great result as far as I’m concerned. Yes, I’m still on a quest to turn my family vegetarian! One day it will happen. In the meantime I’ll keep working on them, I say them but it is mostly my daughter that is not ready to give up the bacon just yet, and that’s ok. I’ll wait for the tweenage rebellion of going vegetarian and I’ll be so ready for it! This vegetarian lasagne has a rich tomato sauce with a little hint of red wine and a little hint of heat from the chilli flakes. Not enough for a kid to notice mind, just enough to add a little extra oomph to the sauce. I used portabella mushrooms, courgettes and a chargrilled red bell pepper for the filling, but you could change that up a bit if you like, more mushrooms works really well as does roasted aubergine. The white sauce is thick and creamy, with extra cheesiness from the mature cheddar. You can leave the cheese out if you wish but I recommend leaving it in, this is pure comfort food, definitely not diet food. I went all out with the mozzarella, well what is a lasagne if it is not cheesy and gooey. 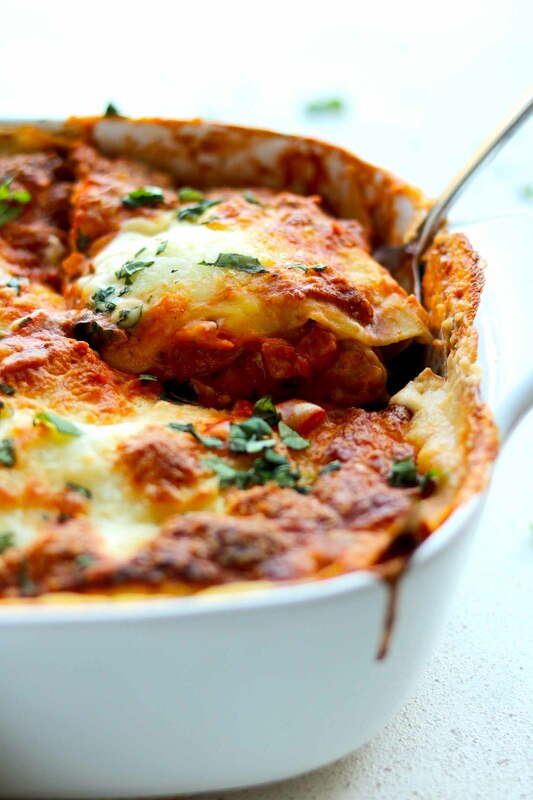 To freeze the whole lasagne – make sure you use a dish that is suitable for freezing. Assemble the lasagne then leave it to cool completely. Do not cook it. Cover and label the lasagne before you put it in the freezer. Use with one month. Defrost fully before cooking. Cook in a preheated oven, 180 C / 356 C for 40 minutes or until bubbling and the cheese is golden brown. Freezing leftovers – leave the lasagne to cool completely. Divide leftovers into portion sizes then put them into individual freezer bags or small food boxes, label and place in the freezer, use within one month. Defrost completely before cooking. Cook in a preheated oven 180 C / 356 F for 30 minutes or until it is bubbling and cooked through. The silver and cardboard takeaway style boxes are great for individual portions as you can just pop them in the oven, if using freezer bags transfer the lasagne to an ovenproof dish before cooking. A rich and creamy vegetarian lasagne, our all-time favourite lasagne recipe. Perfect for cooking ahead of time and having in the freezer for easy weeknight comfort food. Heat the oil in a large saucepan, add the onion and cook over a medium heat for about 5 minutes. Add the celery and carrot and cook for another 5 minutes. Next, add the garlic, red chilli flakes and dried oregano and cook for 1 minute. Now turn up the heat, pour in the wine. Stir it and let it bubble down for a few minutes. Finally, add the passata, the bay leaf, black pepper and salt then turn down the heat and let the sauce simmer until it has reduced by a third and is nice and thick. Remove the bay leaf then set aside until you are ready to assemble the lasagne. Melt the butter in a saucepan over a medium heat. Add the flour and stir until you have a roux. Slowly whisk in the milk. Once all the milk has been added and you have a thick white sauce bring to the boil then reduce to a slow simmer. Stir in the mustard and pepper. Turn off the heat then stir in the grated cheddar. Set aside until you are ready to assemble the lasagne. Preheat the oven to 180 degrees C, 356F. I use an electric fan assisted oven please adjust according to your own oven. Spread a serving spoon of tomato over the base of your casserole dish. Place the lasagne sheets over the sauce, then top that with half the courgette, followed by half the mushrooms and half the red pepper. Cover the vegetables with half the tomato sauce then pour over some of the white sauce. Top with sheets of lasagne then repeat. I had two layers. Pour the remaining white sauce over the last layer of pasta sheets then liberally spread the grated mozzarella over the top. Place the lasagne on the middle shelf of the oven and back for 40 - 45 minutes. The sauce should be bubbling and the cheese should be golden brown. Once the lasagne is done, leave it to sit for 10 minutes before serving. Serve with a green salad or/and garlic bread. I use fresh egg lasagne sheets, if you can't get fresh then the dried lasagne sheets will work well too. To char-grill the red pepper, I set the whole pepper on a small gas ring on the stovetop over a high heat. Once one side is completely black and charred, after about 5 minutes, turn it over and repeat until the whole pepper is black and soft. Place the charred pepper in a bowl and cover with kitchen paper, leave to sit for about 5 minutes. Then with a knife scrape off the black skin. Remove the stem and slice the pepper into strips. If you don't want to chargrill the pepper then you can buy roasted red peppers from the deli section in your local supermarket. They will come in a jar filled with brine. Can't find passata? Two tins of chopped tomatoes will work well too. Just break up the tomatoes with a wooden spoon when cooking. My casserole dish was 24cm x 24cm and 6cm deep. 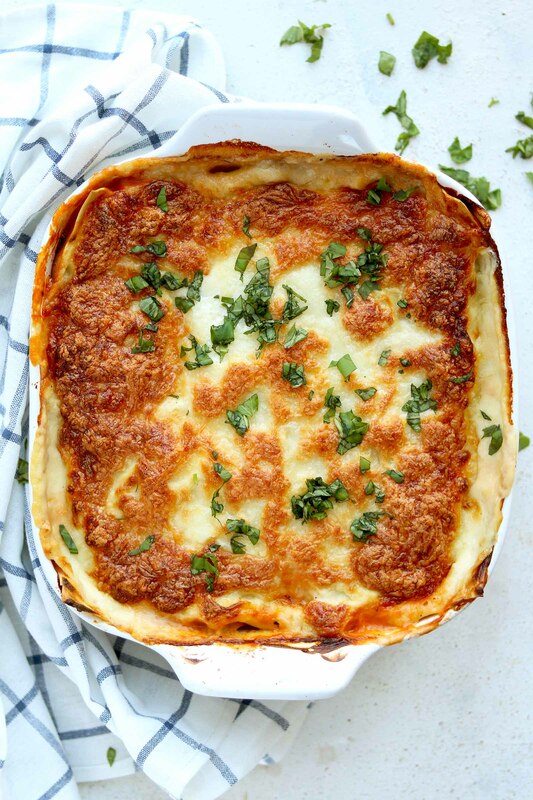 Looks amazing and healthier than so many lasagna recipes. Can I use fresh tomatoes instead of passata and still get the same result?